Highway Hawk Back Off Stuur is toegevoegd aan uw winkelwagen. 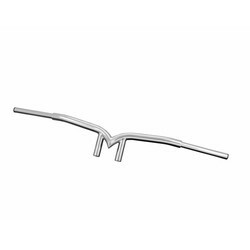 Highway Hawk Back Off Lenker R - 32 mm (1 1/4'') in Chrome Slotted for internal wiring TÜV approved. A - 9 cm B - 12 cm C - 104 cm Made of High Quality Chromed Steel Note: For models with riser mounted handlebars.